The dominant physical attribute when discussing the abilities of infielders is quite often the HANDS. Fielders need soft hands to handle those hot shot grounders that scream across the infield dirt. They need strong hands to handle those escaping bounders that create the “tweener hop” or a liner in that “can’t get to” spot. Even the wrist angle of the glove hand is critical to create the bond between leather and dirt that won’t allow the baseball to find its way under fielder on the routine play. Without the “hands” to field the ball an infielder’s attempt of executing his main task turns futile. However, that same player’s feet may play just as critical a role in determining how successful the fielder is in showing his skills on the dirt. If the hands are important to finish the task of fielding, then the feet are essential to beginning the exercise. The ability of the player to first arrive at the location where the ball can be fielded is critical. Secondly, the sequencing of steps and the accompanying positioning of the infielder to gather the ball provide a foundational stance posture from which to address the grounder. Lastly, the rhythmic steps so often associated with the delivery of a throw to an awaiting teammate for the out brings to mind that the feet are vitally important in all phases of infielder performance. Some general thoughts on the fielding position and how to arrive in this stance brings into the conversation of the player’s readiness prior to the pitch; which once again calls to focus on the FEET. Ready positions for infielders are regularly recognized as having a bend in the knees and weight forward in respect to the feet. The ready position should be done just as the pitch is delivered and can be accomplished with a slight hop or even sequenced steps. From READY, the infielder takes steps to address the angle, distance and speed of the ball, as well as the most advantageous “stance” of fielding the ball that can be leveraged into a transition for the throw. Getting into a fielding position can be guided by some widely accepted consistencies regardless of points of view concerning hand actions. Feet should be just wider than the shoulders with the knees slightly inside the in-step. The glove hand foot should also be forward. This base provides the foundation for allowing the infielder to bend at the knees and create a low hip angle that will project the glove/hands in front relationally to the feet. Equally important to achieving this positioning is the timing of such action. A fielder whose feet are late will disallow the glove to be positioned in the correct proximity and angle to gather the ball; the result is hands that appear “hard.” The reality is that the feet are the culprit in these situations. Conversely, movements that provide the fielder to get into a position too early, negates any rhythm and flow that can be used to aid the throwing motion. Also, the infielder appears to be sitting and waiting on the ball instead of closing ground in order to take steps away from the baserunner. Player should recognize the relationship between hand positioning, head positioning and the positioning of the feet to create the best circumstances to field ground balls in a variety of situations. The most adept glovemen are able to seamlessly maneuver the transitions from ready, to fielding, and on to the throw with fluid actions. Consider a few drills that provide players support to achieve solid footwork in fielding ground balls. Triangle Drill … Pre-mark foot positioning for a perfect fielding stance. Fielders should then mark the glove position on the dirt in relation to the feet. The angles should be pronounced and not flat, creating a triangle that suggests some height at its apex. After taking a few rolled ground balls from this position, the fielder should transition the drill to movement. By backing off the triangle and moving into this perfect fielding position the fielder creates the opportunity to experience “moving into” a fielding position. Additional reps can have the action begin upon the roll of the baseball to its route with precision. This can be provided to address the timing mechanism for the skill. 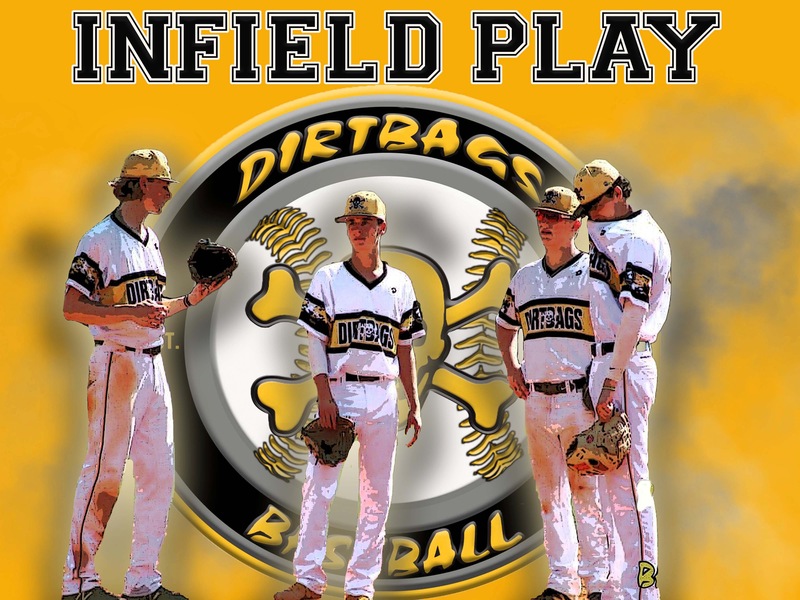 Bucket Drill … Either done in conjunction with the Triangle Drill or independently, the Bucket Drill is simply a routine to address those ground balls that are directed at the infielder. With the fielder behind the bucket (actually it could be a cone, or an X on the dirt), the drill begins with achieving the ready position and addressing the ground ball directed at the obstacle by going around the “bucket.” This is done to create angle and momentum for a field & throw to first base. This drill definitely exposes the fielder that is routinely late with their feet, in addition to the player that sits back on the ball as he waits for it to travel. Middle IF Feeds … So many options and variety when considering footwork on MIF feeds. Players must learn to identify what footwork needs to be executed on different balls considering qualifying factors. Which side of 2B, distance of the ball from the bag, and skill level of the fielders can be used to determine how to handle balls in a way to deliver the best feed. The type of throw for each feed should be relative to the distance from the bag as the player fields the ball. Have fielders make throws from a perfect fielding position on a static ball from each of the 3-4 predetermined distances. Again, add movement by rolling the ball to the fielder as they next take a few steps into the perfect fielding position (this is a controlled movement situation that should foster success). Finish by having the infielder access each ball for a middle feed from their typical positioning in a double play situation. Remember, that while the infielder’s hands may get all the attention for his defensive prowess, getting to the level to be considered one of the best on the dirt happened one step at a time – literally.